The MINI Countryman is entering the market with a choice of three petrol and two diesel engines, all coming in the new generation of power units developed with the full know-how of the BMW Group and naturally complying with the EU5 and, respectively, ULEV II emission standards. The power range extends from 66 kW/90 hp in the MINI One D Countryman all the way to 135 kW/184 hp in the MINI Cooper S Countryman. The 1.6-litre four-cylinder petrol engine in the top model comes for the first time not only with a twin-scroll turbocharger and direct fuel injection, but also with fully variable valve management offering by far the best balance of engine power and fuel consumption in its class. As a particular highlight of the MINIMALISM fuel efficiency concept, the MINI Countryman comes as standard and in appropriate combinations on each model with a wide range of features serving to reduce fuel consumption and emissions, among them Brake Energy Regeneration, Auto Start Stop, a gearshift point indicator, and on-demand management of the engine’s ancillary units. And as an alternative to the six-speed manual gearbox featured as standard, the petrol engine models are also available with six-speed automatic complete with Steptronic. As an option the MINI Cooper S Countryman and MINI Cooper D Countryman are available with permanent MINI ALL4 all-wheel drive, an electrohydraulic differential positioned directly on the final drive varying the distribution from front to rear in an infinite process. Under normal driving conditions up to 50 per cent of the engine’s power goes to the rear wheels, under extreme conditions up to 100 per cent, offering a new, high-traction rendition of that agile handling so typical of MINI. This superior traction and drivetrain technology is based on the top-end suspension of the MINI including features such as the front axle with McPherson spring struts and forged track control arms, the multi-arm rear axle and EPS Electric Power Steering complete with Servotronic. 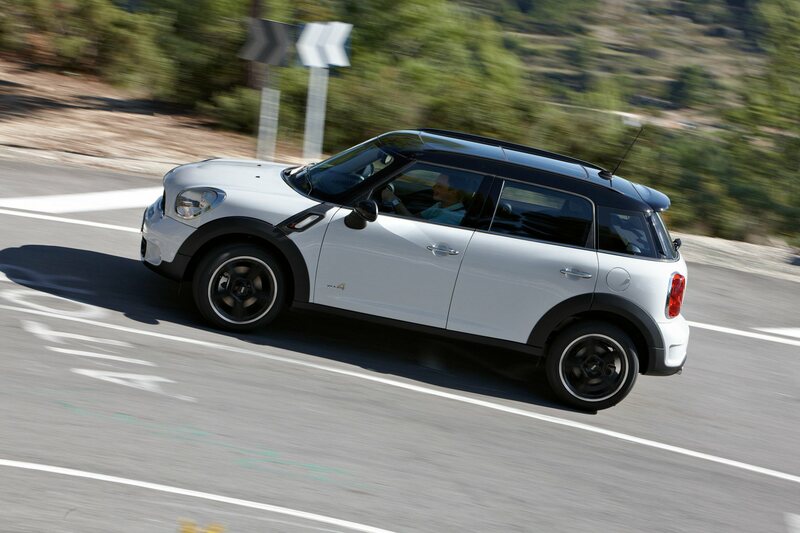 The MINI Countryman furthermore comes as standard with DSC Dynamic Stability Control, DTC Dynamic Traction Control coming either as an option or as a standard feature on the MINI Cooper S Countryman and the MINI Cooper D Countryman with ALL4, as well as an electronic limited-slip function for the front axle differential. Designed for optimum safety in the event of a collision, the body structure with its precisely defined load paths and deformation zones ensures passive safety of the highest calibre. Frontal and side airbags as well as curtain airbags at the side both front and rear, three-point inertia-reel seat belts on all seats, belt latch tensioners and belt force limiters at the front, as well as ISOFIX child seat fastenings at the rear all come as standard. Yet another standard feature is the Tyre Defect Indicator, with runflat tyres coming as an option and standard on the MINI Cooper S Countryman with ALL4. The wide range of customisation options on both the exterior and interior again so typical of MINI are supplemented by new, model-specific features exclusive to the MINI Countryman. New combinations in the range of interior colours, trim strips and upholstery enable even the most discerning customer to create his – or her – very special car with truly unique character. The wide range of standard features boasted by the MINI Countryman includes highlights such as air conditioning, the MINI Center Rail, and an audio system complete with a CD player. The equally wide range of options and special equipment tailored to each model comes with features such as high-end audio and navigation systems as well as mobile telephone interfaces including the option to completely integrate an Apple iPhone and other Smartphones in the car. Further options are the extra-large Panorama roof, Adaptive Headlights in combination with xenon headlight units, a heated windscreen, a towbar, light-alloy wheels ranging in size from 16 to 19 inches, sports suspension lowering the entire car by 10 millimetres or almost 0.4″, as well as the wide range of John Cooper Works Performance Components.